Donald McKayle, (July 6, 1930-April 6, 2018), was the recipient of honors and awards in every aspect of his illustrious career and was named "one of America’s Irreplaceable Dance Treasures: the first 100" by the Dance Heritage Coalition. His choreographic masterworks, Games, Rainbow ‘Round My Shoulder, District Storyville and Songs of the Disinherited, are considered modern dance classics and are performed worldwide. He choreographed over 70 works for dance companies in the United States, Canada, Israel, Europe, and South America. The Alvin Ailey American Dance Theater, the Cleo Parker Robinson Dance Ensemble, Ballet San Jose Silicon Valley, the Dayton Contemporary Dance Company, and the Lula Washington Dance Theatre have served as repositories for his works. Until his death, McKayle served as Artistic Mentor for the Limón Dance Company. Ten retrospectives have honored his choreography and in 2005, he was honored at the John F. Kennedy Center in Washington, D.C. where he was presented with a medal as a “Master of African American Choreography”. In 2001, McKayle choreographed the monumental ten-hour production of Tantalus, produced by the Royal Shakespeare Company in collaboration with the Denver Center Theatre Company. Five Tony Nominations have honored his choreographic work for Broadway musical theater for shows including Sophisticated Ladies, Doctor Jazz, and A Time for Singing. For Raisin, which garnered the Tony Award for Best Musical, McKayle received nominations for both direction and choreography. For Sophisticated Ladies, which McKayle conceived, he received the Outer Critics Circle Award and the NAACP Image Award. His most recent choreography for Broadway was showcased in It Ain’t Nothin’ But the Blues, which earned a Tony nomination for Best Musical. His work in film includes Disney’s Bedknobs and Broomsticks, The Great White Hope and The Jazz Singer and McKayle earned an Emmy nomination for the television special, Free To Be You and Me. Other honors include a Los Angeles Drama Logue Award for Evolution of the Blues and a Golden Eagle Award for On the Sound. Recognition of Mr. McKayle’s accomplishments in the field of dance include the Capezio Award, the Samuel H. Scripps/American Dance Festival Award, the American Dance Guild Award, a Living Legend Award from the National Black Arts Festival, the Heritage Award from the California Dance Educators Association, two Choreographer’s Fellowships from the National Endowment for the Arts, the Dance/USA Honors, an Irvine Fellowship in Dance, the Martha Hill Lifetime Achievement Award, the Annual Award from the Dance Masters of America, the Lifetime Achievement Award from the Dance Under the Stars Choreography Festival, the Black College Dance Exchange Honors, the Dance Magazine Award, and the American Dance Legacy Institute’s Distinguished and Innovative Leadership Award. For his contributions in the field of education, Mr. McKayle received the Balasaraswati/Joy Ann Dewey Beinecke Endowed Chair for Distinguished Teaching, the University of California, Irvine’s (UCI’s) Distinguished Faculty Lectureship Award for Research, as well as the UCI Medal, the highest honor awarded by that institution. He received the title of Claire Trevor Professor in Dance, an endowed chair, and was named a Bren Fellow by UCI. McKayle served on the faculties of numerous international forums and prestigious national institutions including the Juilliard School, Bennington College, Bard College, Sarah Lawrence College, the American Dance Festival, Jacob’s Pillow Dance Festival, and was Dean of the School of Dance at the California Institute of the Arts. His autobiography, Transcending Boundaries: My Dancing Life, published by Routledge, was honored with the Society of Dance History Scholar’s De La Torre Bueno Prize. A television documentary on his life and work, Heartbeats of a Dance Maker, aired on PBS stations throughout the United States. Val Caniparoli's versatility has made him one of the most sought after choreographers in the United States and abroad. Although he is most closely associated with San Francisco Ballet, his artistic home for more than 40 years and former resident choreographer, Caniparoli has contributed to the repertories of more than 45 companies, including Texas Ballet Theater, Joffrey Ballet, Scottish Ballet, Boston Ballet, Hong Kong Ballet, Pacific Northwest Ballet, Northern Ballet Theatre, Pennsylvania Ballet, Royal Winnipeg Ballet, Ballet West (resident choreographer 1993-97), Washington Ballet, Israel Ballet, Richmond Ballet, Louisville Ballet, Cincinnati Ballet, Singapore Dance Theatre, Atlanta Ballet, State Theatre Ballet of South Africa and Tulsa Ballet (resident choreographer 2001-06 ). Caniparoli has also choreographed for the Chicago Lyric Opera, San Francisco Opera, and The Metropolitan Opera. He has worked on several occasions with the San Francisco Symphony, most recently on the Rimsky-Korsakov opera-ballet Mlada, conducted by Michael Tilson Thomas. Caniparoli has been the recipient of ten grants for choreography from the National Endowment for the Arts, an artist fellowship from the California Arts Council, and two awards from the Choo-San Goh and H. Robert Magee Foundation. Work with American Conservatory Theater in San Francisco includes choreography for A Christmas Carol, A Doll's House, A Little Night Music, Arcadia and the creation, with Carey Perloff, of a new movement-theater piece, Tosca Cafe. Gregory P Dawson, a former Lines Ballet dancer, formed dawsondancesf (ddsf) in 2007 as an outlet for his choreographic goals and vision. Shortly thereafter he created which light in the sky is us for Company C Contemporary Ballet (nominated for an Isadora Duncan Award for choreography) and became the Assistant Director of the California State Summer School of the Arts’ Dance Department in Southern California. In the fall of 2011, Mr. Dawson became Artistic Director of Dawson Wallace Dance Project in Denver, Colorado, where the Denver Post named him “the best choreographer in Denver.” Soon after, Dawson received a CHIME grant, partnering him with choreographic mentor Elizabeth Streb. In September 2013, dawsondancesf re-established its presence in San Francisco with the world premiere of fabricca matterasso d’argento at Zaccho Dance Theatre. Following this, Mr. Dawson created birds eye view (a collaboration with the Richard Howell Quintet) for the 2014 Black Choreographers Festival, which received an Isadora Duncan Award. In the Fall of 2014, Dawson premiered in this moment with Richard Howell and in the same year ddsf made its debut in New York City. The Zellerbach Foundation funded the premiere of his intrinsic motion project, and in the summer of 2015 ddsf completed a five week residency at CSSSA’s summer intensive at Cal Arts where Dawson is assistant to the Chair. Dawson, who received a BA from Saint Mary's College, currently teaches and choreographs for all LINES Ballet Educational Programs. In 2016 ddsf received three Isadora Duncan Nominations for Outstanding Achievement in Performance. Ronn Guidi founded Oakland Ballet in 1965 and rose to international prominence through his work reconstructing and staging ballet masterpieces of Sergei Diaghilev's Ballet Russes. He gained stature, too, with his staging of Americana classics and through choreographing over 50 original ballets. Menlowe Ballet's Artistic Director Michael Lowe started his professional career with Guidi at Oakland Ballet. Guidi was a guiding inspiration when Lowe launched his own choreography career. For Menlowe Ballet, Guidi shared two ballets which represent both ends of his choreographic spectrum. Trois Gymnopedies and the pas de deux from his full-length ballet, Romeo and Juliet. 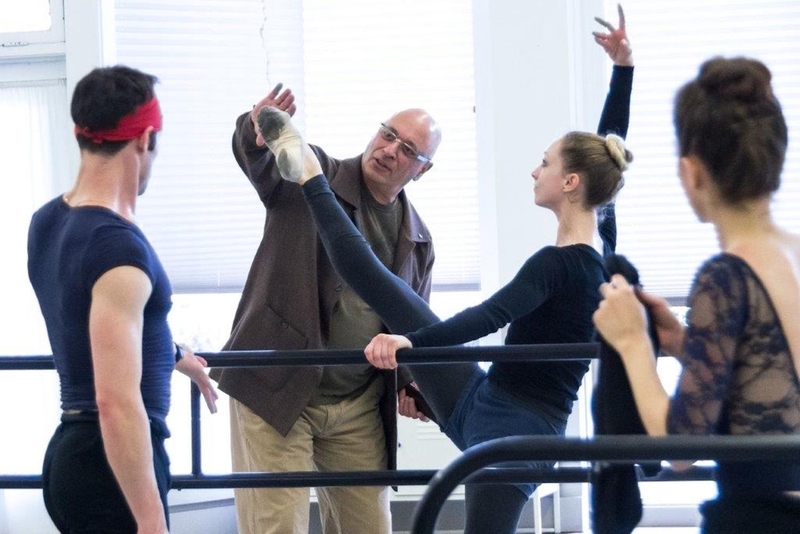 "Menlowe Ballet seems like the logical home for my ballets," Guidi said. "It's been a joy for me to watch Michael grow from dancer, to gifted choreographer, and now to artistic director. Michael knows my work well, so adding my ballets to the Menlowe Ballet repertoire is exciting. It's as if it's all still part of the family." Betsy Erickson, a balletmaster with San Francisco Ballet since 1992, boasts an association with that company stretching back to her debut in Nutcracker in 1963. Although she left to dance with American Ballet Theater for five years, she returned in 1972 and performed with distinction until retiring in 1984. After her retirement, she choreographed several ballets which were set on Oakland Ballet where she also worked as a balletmaster and first met Michael Lowe. After Lowe launched Menlowe Ballet, they decided to work together again. "Michael said he'd like his dancers to experience something more classical. So I went to see the company; they're very physical, very athletic, fresh and different...Since they're such brilliant movers, I proposed Songs." Set to Richard Strauss, it had premiered with Oakland Ballet in 1990.